With most of the films are made to entertain the audience, few others clubbed with essence to keep them think even while leaving the theatres would stand apart. Gee Manu is such a filmmaker who wishes to walk through the path less has traveled. Having an experience staying behind the camera, Gee Manu is all set to deliver a visual treat fully motorized with cogent thoughts. 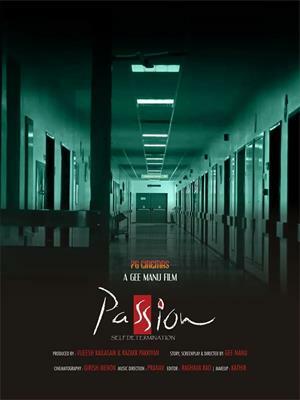 Titled 'Passion', the movie scripted and directed by Gee Manu will have Rajesh Hebbar and Ishwar playing the lead roles. The movie is themed around 'Naduvil Madom' which stays as a miraculous place of heal and cure. Naduvil Madom Nelakandan Namboothari (Rajesh Hebbar) is a respectable person having a peculiar power of foreseeing things with the use of his inner eyes. The physicians of Naduvil Madom are well talented with unique abilities and even given life to many people through their medical practice. Nelakandan Namboothari, well known for his extraordinary strength has cured even those diseases which have deep roots. Once a man, who was too worried about a problem comes to see Namboothiri. During their conversation, the thought about the gap between life and death kept the discussion alive. Medical science has proved that even after death, the human cells would survive for 6 hours. Those important body parts taken from dead people have been transplanted to ailing people and proved to be success. So what happens between life and death? According to Namboothiri, death cells cannot be found and replanted. His journey into the problem forms the story. Dr Ishwar (Ishwar), the son of Nelakandan Namboothari after completing MBBS is currently serving as a surgeon of Medical college. With much knowledge about traditional medical practices, he provides a unique treatment, a mix of conventional and Alopathy. As both father and son were friends, they used to take time to know each other. The varied opinion about life and death deliberately made them to take their own approach which later throws light to some issues. Pooling into contemporary truth, the movie tests the cogent thoughts of human beings. Arjuna, Vineesh, Subramaniyam Bhattathiripadu, Sreemoolanagaram Ponnan, Kottayam Jose, Priya Menon, Ambili and Sumangala will give life to other prominent characters in the movie. The movie is produced by Vijeesh Kailasam and Rasaak Pakkiyan under the banner of 7G Cinemas. The tunes are set by Vishal Sivaprabu. After the wrapping up of the shooting which is being carried out at Kayamkulam, the movie would reach theatres in a couple of months.